Slice tofu in half and press dry with paper towels. Cut into cubes and pan fry in sunflower, olive or preferred oil in a nonstick skillet over medium heat until golden brown. Saute mushroom in 1 tbsp. olive oil over high heat until tender, season with salt and pepper and set aside. Saute bean sprouts in a touch of olive oil until slightly tender and set aside. With a fork, stir all sauce ingredients in a small bowl until fully incorporated. 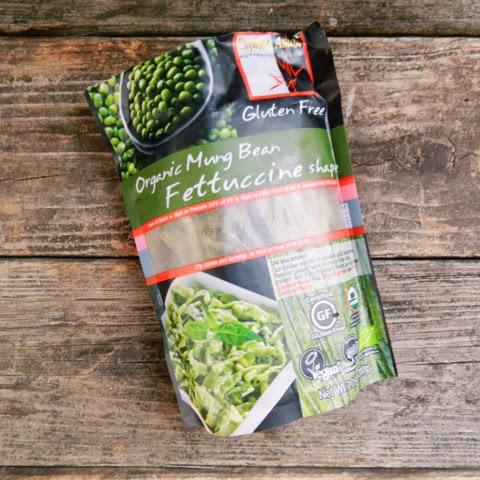 Cook mung bean fettuccine according to package, or until al dente. 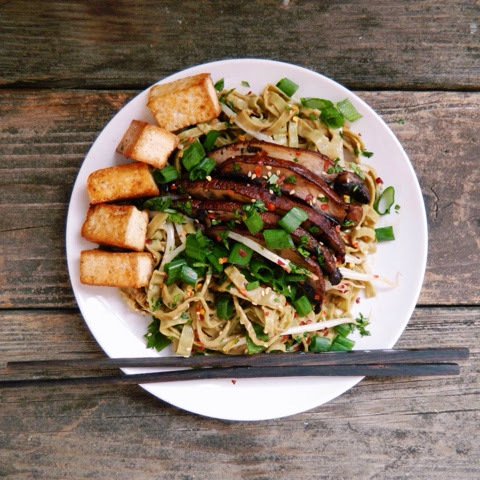 Toss mung bean fettuccine with bean sprouts and peanut sauce. Place mushroom and tofu on top. Garnish with scallion, cilantro, sesame seeds and red pepper flakes.